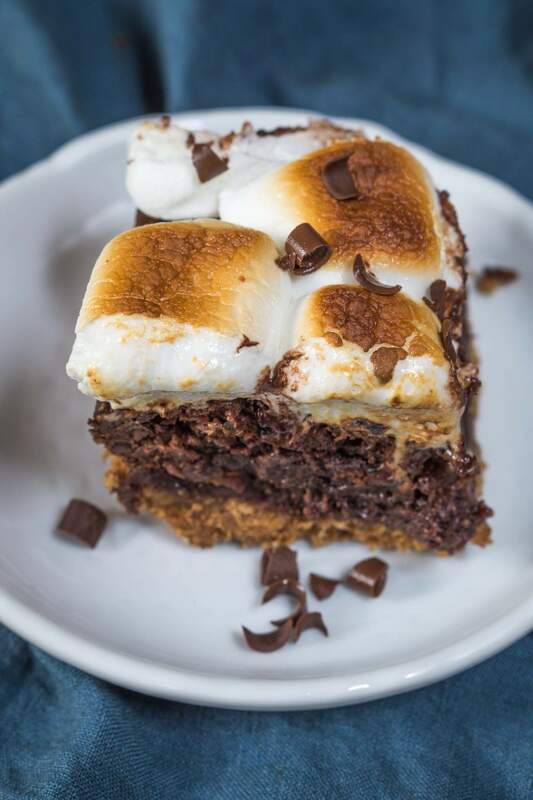 Thick Fudgy S’mores Recipe may look like a hot mess, but they are a big chocolatey bite of heaven. 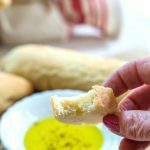 They are quick, easy, and delicious! One bite and you’ll be making them regularly. A while back I was invited to participate in an evening at Crave. One of my favorite dishes was their s’mores dessert. I just had to try to make this amazing dessert. National S’mores Day is August 10. That gave me the perfect excuse to give this Thick Fudgy S’mores recipe a try. This recipe is made in a loaf pan to guarantee that everyone gets a view of each and every layer. It’s not hard to make and it looks like the hot mess that describes s’mores. Plus it’s semi-homemade so you can whip it up in a jiffy! 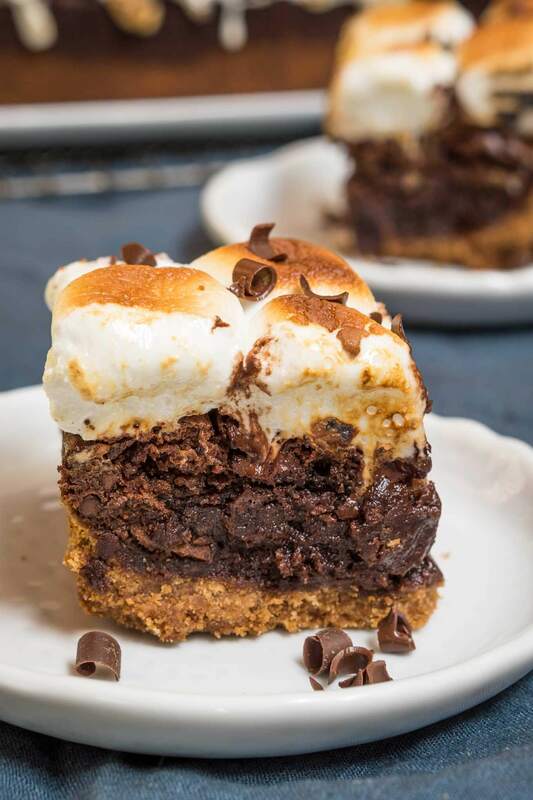 Thick Fudgy S'mores Recipe may look like a hot mess, but they are a big chocolatey bite of heaven. 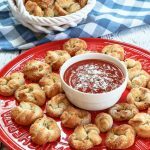 They are quick, easy, and delicious! Preheat your oven to 350°F. Spray an 8x5 loaf pan with non-stick spray and line it with parchment paper leaving the ends to hang over the edge of the pan so you can lift it out. Melt butter and add the graham cracker crumbs and the sugar. Stir together and press it into the bottom of the pan and a little up the sides. Bake for 10 minutes. Mix the brownies together according to package directions. Pour the mix on top of the graham cracker crust. Bake according to brownie package directions. Don't over bake. As soon as they come out of the oven, top with chocolate chips and then the large marshmallows. Place under the broiler for 1-1/2 minutes or until golden brown. Watch carefully. Allow to cool completely, Remove from the pan by lifting parchment paper. Cut and serve. Store at room temperature. Cut with a dry hot knife. 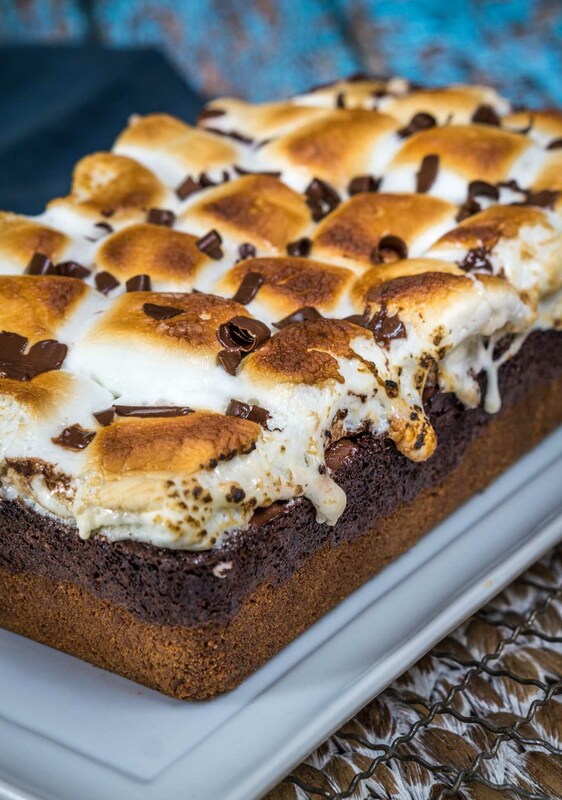 Need some more s’more recipes? Well, that looks like a sugar high if I every saw one. Thanks for sharing! Matt it is which is why I tried it, took photos and then marched it right over to the neighbors! Thanks for stopping by! They look so wonderful ! Thank you Swapna! Easy and delicious. Oh, I love s’mores and this recipe is so easy! I will definitely try it soon! Thank you Ana! Warning, it is dangerous to have around. I could really go for a slice of this….. Thank you Debbie! Glad you did well on your last procedure! Thank you Petra! I cut them like a slice of bread. A warm knife goes through the marshmallow a bit better. I hope you enjoy them. We did a bit too much. I had to share with the neighbors so I didn’t eat the whole thing myself. Thank you for sharing Sonal! Wow Julie, absolutely decadent and oh so moreish. These wouldn’t last with me around. I’ve never really made smores before, and probably only tried it a couple of times when our kids were younger. But I’ve got to remedy that soon haven’t I? 🙂 Love the layers and the different flavors combined. A winner for sure for kids and adults alike 🙂 Enjoy your weekend. Thank you Loretta! It was definitely a dangerous dessert to have around. I gave the neighbors quite a bit just so I couldn’t devour more than was humanly possible. We had a wonderful weekend and hope you did too! A hot mess??? I think NOT. 😛 I’m ready to dig right it…these look FABulous, Julie! Thank you Nancy! It was definitely a dessert worth digging into. Hope you had a wonderful weekend. I agree with Suzanne as I know I would like your recipe better than the traditional smores. The kids always made such a mess and everything was sticky but they had fun! Thank you, Judi! It is pretty darned good, but I would never turn down a yummy s’more over a campfire either. We had to share with the neighbors so we didn’t devour it all ourselves. Wow. That’s a delicious looking dessert! 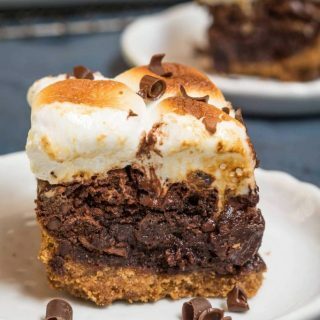 Hi Julie- I’ve be hearing and seeing so much about S’mores, but I’m yet to try one.A big sugar fix for me so I’d have to save for a treat dessert – but your version looks delicious. 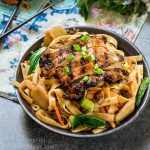 For this post or future ones to qualify for features selection for Fiesta Friday you simply need to link the post to the week’s co-host or co-hosts…..this week it’s myself at Feast Wisely and Su from Su’s Healthy Kitchen! Thank you for hosting Laura! It is definitely a great sugar fix. I appreciate you hosting this week too, and Su is a great partner to have for it. Thank you, Mara! It was delicious messiness. 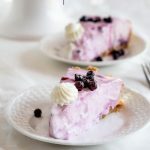 I think the recipes that look like a hot mess are some of the best ones! Yours looks so chocolaty and decadent, Julie. What a great take on smores. I agree with Suzanne, I think I would like this better than regular smores, too. Thanks for bringing this to Fiesta Friday! Thank you Shari! I have to agree with Suzanne too. Hope you are having a wonderful weekend! 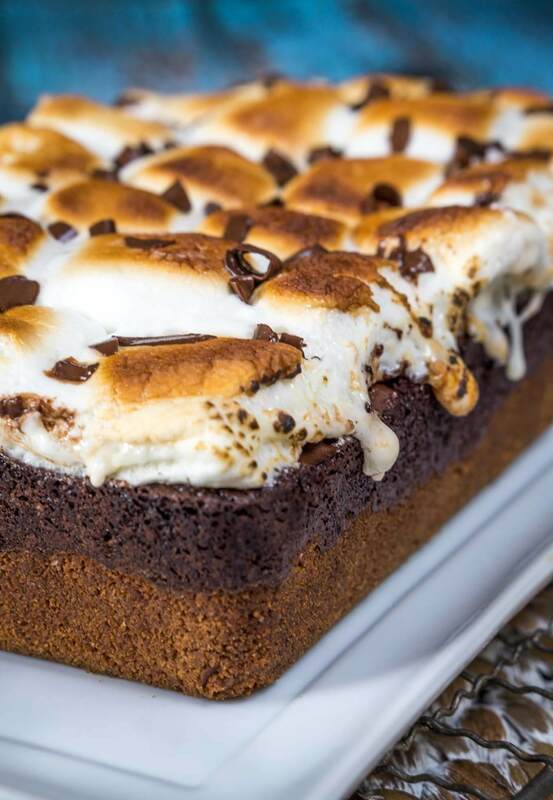 Once I tried S’mores Brownies for the first time, you better believe that I NEVER went back to normal brownies again. It’s literally one of the best things I’ve ever eaten. Yours look divine Julie. It’s like smores for grown-ups even though I wouldn’t be above devouring a good ole smore over the campfire. Thanks, Jess! I know right? It was so good and we had to share it with the neighbors so we wouldn’t gobble it all ourselves. I think I would like this better than a traditional s’more!! I’m agreeing with you Suzanne! Thank you!